Court • Judge tells doctor's family he "can't even imagine" the "nightmare" they are going through. Steve Griffin | The Salt Lake Tribune Dewey C. MacKay and his wife, Kathleen MacKay, get into a car waiting outside the Frank E.
Steve Griffin | The Salt Lake Tribune Dewey C. MacKay and his wife, Kathleen MacKay, get into a car waiting outside the Frank E. Moss U.S. Courthouse in Salt Lake City on Monday Dec. 19, 2011, following sentencing hearing for charges related to prescribing more than 1.9 million hydrocodone pills and nearly 1.6 million oxycodone pills between June 1, 2005, and Oct. 30, 2009. His attorney Peter Stirba is at right. A Brigham City doctor convicted of illegally distributing painkillers won't be reporting to prison next month after all. U.S. District Judge Dee Benson on Wednesday denied a request to allow Dewey C. MacKay, 64, to stay out of prison while his attorneys appeal his guilty verdict and 20-year prison sentence. But the judge also granted a request from MacKay's attorney, Peter Stirba, to allow MacKay to stay out of prison while Stirba appeals Benson's Wednesday ruling. That appeal to the U.S. 10th Circuit Court of Appeals in Denver could take weeks or even months, meaning there now is no firm date set for when MacKay is to report to prison. Benson's ruling, announced at the end of the hearing just when it appeared that MacKay wouldn't be allowed to stay out of prison longer than Feb. 1, brought relieved smiles from MacKay supporters who attended court. In denying the first request from defense attorneys to allow MacKay to stay out of prison while he appeals his overall case, Benson said the defense had not adequately shown they can argue a substantial issue of law or fact on appeal  a requirement for allowing MacKay to stay out of prison during the appeal. He also said there were not "exceptional reasons" to allow MacKay to stay out of prison on appeal. MacKay's attorneys tried to argue his failing health could be considered an "exception" to delay his report to prison. MacKay's primary care physician, John Markeson, testified at Wednesday's hearing that MacKay's stress level during the past year has increased his likelihood to suffer a heart attack or stroke. He said that MacKay, who had heart bypass surgery in 2001 and in April of last year underwent an angioplasty, takes about $1,000 of medication each month, including insulin and drugs to control is blood pressure and high cholesterol and worried that MacKay won't get his needed meds in prison. Assistant U.S. attorney Michael Kennedy argued that patients with more severe medical needs than MacKay report to prison all the time. He cited other defendants he has prosecuted that have needed dialysis three times a day and have received such care in federal prison. Moreover, law states that MacKay must be detained in prison during any appeal, Kennedy said. Besides MacKay's medical conditions, Stirba tried to argue that the 10th Circuit could overturn the jury's verdict on grounds of insufficient evidence at trial. He said the case against MacKay should have been handled civilly through malpractice claims and not through criminal charges. There was not clear evidence at trial that showed MacKay intended to hand out prescriptions without a legitimate medical purpose, Stirba said. Benson told MacKay he believes the jury's verdict was based on sufficient evidence presented at trial, but again expressed sympathy to MacKay and reiterated that the 20-year mandatory sentence handed down was "too long." Benson said he wishes the "humanitarian" side of him could have issued a different ruling to keep MacKay out of prison throughout the entire appeal. Granting the defense's request to keep MacKay out of prison while they appeal Wednesday's ruling, however, was the best Benson said he could do. "It's very easy to get almost teary-eyed over the health issue alone," Benson said. "This is so hard for people who love and admire and respect this man, which is many." Benson told MacKay's family that he "can't even imagine" the "nightmare" they are going through. "It must be like a black cloud," he said. He said that America's jury system is not perfect, but added that jurors in MacKay's case performed their jobs diligently. Some of MacKay's victims petitioned Benson in the days leading up to Wednesday's hearing asked that MacKay report to prison on the Feb. 1 date initially set by the court. Kim Millett of Brigham City wrote to Benson describing how prescriptions given to her daughter by MacKay turned her family upside down. During the worse part of her daughter's addiction, Millett, 50, was forced to contact the Utah Division of Child and Family Services and the Box Elder Narcotics Strike Force after her daughter's erratic behavior made her a stranger from the person she had once been. Her daughter lost custody of her children and landed in jail on drug charges. Millett blames MacKay for contributing to her daughter's problem. "Addiction made many of his patients somewhat powerless; he suffered from no disease that made him powerless; he simply chose to be reckless. In some cases, I truly believe he created addicts to support his business," Millett wrote in her letter asking Benson to deny allowing MacKay to stay out of prison during the appeals process. "He did, at least in my daughter's case, know exactly what was going on. He signed the papers for two doctor shopping felonies and still continued to see her for years. He did not talk to her about it, question her motives, or anything else. He prescribed every pill knowing she had a problem." A five-week trial for MacKay that ended in August stemmed from a 2010 indictment on charges related to prescribing more than 1.9 million hydrocodone pills and nearly 1.6 million oxycodone pills between June 1, 2005, and Oct. 30, 2009. 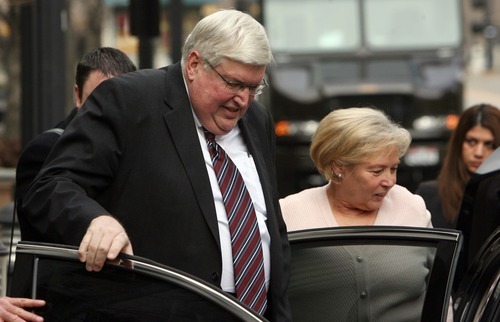 Jurors convicted MacKay on 40 counts related to illegally distributing painkillers. Several prominent Utahns wrote letters to Benson on behalf of MacKay before the sentencing, including Rep. Rob Bishop, R-Utah, and Utah State Senate Assistant Majority Whip Peter Knudson, R-Brigham City. Most letters have asked the judge if there is an alternative to sending MacKay to prison. Millett wrote to Benson to say the opposite. "My daughter, like many of Dr. MacKay's patients from what I hear, was not an addict when she first went to see him. She is now and will forever be an addict. At any given moment she may be an addict in recovery or an addict that has 'fallen off the wagon' but she will always be an addict. She will always have to be on guard and working her program to prevent that slippery slope back into addiction. Regardless, what level of pain she has in the future she will most likely never again be able to take narcotic pain meds except maybe in a hospital setting. It would likely trigger a relapse and none of us want that," Millett wrote. She told Benson that discussion during court proceedings that addicts were responsible for their own behavior frustrated her. She wrote that she and her husband, a retired lieutenant with the Utah Highway Patrol, taught their children to be responsible and adhere to the law. She said MacKay's statements at his December sentencing, where he accused addicts of duping him into writing prescriptions, were disingenuous. "Dr. MacKay did not show one bit of remorse or responsibility for his actions. His statement simply was more of him touting his own virtues and blaming those lying addicts for getting him in trouble. Yes addicts will sometimes lie to get what they want but they are not always liars," She wrote. "Please do not make the mistake of thinking that because they are addicts (who are also ill as addiction is a disease) that they deserve what's happened, or that they are solely responsible, or that they can never be believed." Stirba said Wednesday that MacKay shouldn't be considered a danger to the community because his medical license has lapsed and the DEA took away his authority to prescribe  more reasons that MacKay could be kept out of prison during the overall appeal. The doctor doesn't have an office to practice out of and has no way of participating in the crimes the jury convicted him of. "It isn't like he was on the street corner illegally distributing drugs," Stirba said. Following Benson's decision, Millett said Wednesday that MacKay's behavior was exactly like that of a street dealer. Many of MacKay's patients turned to street drugs because of their addiction to painkillers, she said. "I don't see the difference between a doctor prescribing irresponsibly and a street dealer doing what he is doing. An addict trusts a doctor to be more responsible," Millett said. MacKay's five-week trial, which ended in August, stemmed from a 2010 indictment on charges that MacKay prescribed more than 1.9 million hydrocodone pills and nearly 1.6 million oxycodone pills between June 1, 2005, and Oct. 30, 2009. Jurors convicted MacKay on 40 counts of illegally distributing painkillers. MacKay was accused of pushing 80 to 120 patients through his office in an eight-hour workday, spending just minutes with each person.